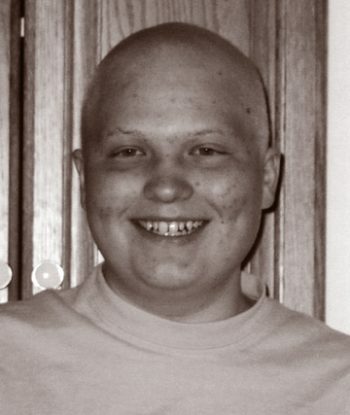 Phil was diagnosed with leukemia in New Castle, Colorado on April 1, 2005 and immediately flew to Denver for treatment. His type of cancer was Acute Lymphoblastic Leukemia and Phil started chemotherapy to try and get his cancer into remission. Unfortunately, Phil’s cancer was very aggressive and responded very slowly to the chemotherapy. The doctors started discussing a Bone Marrow Transplant. All of Phil’s siblings were tested (Brad, Leanna, Christie, Ben, Laura, Alissa, and Holly), and two of his sisters were exact matches! During their stay in Denver, the family stayed at Brent’s Place to be near the hospital. Phil was finally allowed to go home before his transplant for July 4th weekend. He was able to golf and take a ride in a Lotus! Phil loved cars, so this was a much anticipated and treasured experience for him. He returned to Denver for full body radiation and chemotherapy and his BMT on July 14th. Initially, Phil did very well and was in very good spirits. However, in August he developed lung issues and had to stay in the ICU for 5 days. We then started the transition between the hospital and Brent’s Place. Phil was going home! Unfortunately, in September, shortly before his discharge from the hospital, Phil’s lung issues flared again and he lost his battle to cancer on September 27, 2005. He spent 81 days in the hospital and never complained about how sick he was enduring vomiting, diarrhea, and hair loss. He was very brave!